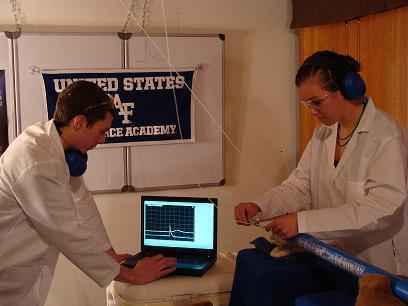 While I served on the math faculty of the US Air Force Academy, we invited numerous cadets to participate in self-funded research projects, often conducting experiments like this one in the basement of our home. When I look over the most highly cited papers and my favorite accomplishments, I am struck by the fact that most of the projects were not funded by an external research grant and many were not even performed while I was “on the clock” in a scientific position. I guess that makes me an amateur. My deep love of science began in elementary school, and I’ve never allowed not getting paid for a project keep me from pursuing interesting scientific ideas. Shortly after soldiers began returning home from conflicts in Iraq and Afghanistan, it became apparent that blast-induced traumatic brain injury (TBI) was affecting a lot of them. Scientists began investigating in earnest how blast exposure could injure the brain and how soldiers could be better protected. A big challenge here is that the expense, legal requirements, and facilities needed to experiment with high explosives greatly limited the laboratory experiments that could be conducted. Blast simulation devices using compressed air (called shock tubes) were available, but these were poorly documented and had the drawback of the “jet effect” of venting all the compressed gas used to generate the shock wave into the subject under test, thus resulting in a total momentum transfer much different from exposure to a real explosive blast. We submitted an unsuccessful grant proposal and took other steps to acquire funding. We’d written a paper reviewing the hypothetical TBI mechanisms and summarizing the evidence supporting a thoracic mechanism of blast TBI, but this was not sufficient to acquire funding for further work. I recall going down to our basement and considering whether a potato cannon without a potato could serve as a more effective laboratory shock tube. First, I shot a wadded up paper ball a few times, and then I glued a piece of paper over where the chamber meets the barrel and tried it that way. Over the years, several of our shock tube inventions were inspired by projectile launchers without the projectile, with our most important device (an oxy-acetylene driven shock tube), inspired by the golf ball launcher in a YouTube video. None of these projects was funded at the time, though we have since earned a few bucks helping other laboratories install them, conducting experiments with shock tubes in our lab, and training scientists in other labs how to make the most productive use from our shock tube designs. It is satisfying to solve a problem in a basement with less than $1000 in hardware store materials that others had been awarded six and seven figure grants to solve. Those who focus on the revenue generating potential of science often forget that Einstein’s most famous papers were written while he was employed as a reviewer in a Swiss patent office. We would also do well to remember that Watson and Crick persisted in their efforts to model the structure of DNA without external funding even after they had been officially taken off the project and assigned other duties by the Cavendish lab. The history of science has many examples of unfunded side projects yielding great discoveries. USAFA Cadets in our basement lab working on a self-funded project to measure barrel friction of lubricated bullets. At every lab I’ve worked in, there are unfunded side projects. My freshman lab experience was at the LSU Aquaculture facility where the funded project was work geared toward the economical production of soft-shelled crawfish for the seafood market. The side projects included attempts to breed rare blue crawfish and improving grape production in Louisiana. When I landed in a physics lab, many of my duties were devoted to the unfunded side projects attempting to generate the 9th harmonic of a Nd:YAG laser in a mix of noble gases and an attempt to measure the coherent dephasing in a jet of Ar:OH-. My research mentor eventually became one of the leading gurus in high-harmonic generation in rare gases. My graduate research was supposed to be high resolution laser spectroscopy of diamagnetic Rydberg atoms as a means of probing quantum chaos, and this was the description of the project in the grants that were paying the bills. However, the experiment hit some snags detecting Rydberg atom production in the magnetic field. About the same time, while brainstorming in my advisor’s office, we realized that non-hydrogenic Rydberg atoms in an electric field would most likely exhibit classical chaos and provide a sensitive probe for important questions in quantum chaos. After I wrote the code and conducted an analysis demonstrating classical chaos in the system, my advisor approved a side project where I would machine the needed capacitor plates for applying an electric field, and we proceeded to conduct a series of productive experiments on lithium Rydberg atoms in an electric field. The side project became my thesis research (and the thesis projects of subsequent grad students), and the magnetic field experiments were forgotten. Sure, there needs to be some way to pay the bills. For most of my career, work as an engineer, teaching, and/or consulting projects have provided the income streams. I have always chased interesting ideas with a passion that has not been hindered by the lack of funding. Good science comes more from the love and desire to get the right answer to an interesting question than it comes from a sense of duty from getting paid or a desire to increase one’s bank account. A lot of my best science has been funded out of my own pocket, yet the delight of being the first to gaze upon one of nature’s mysteries is well worth the investment. Doing science ‘for the love of it’ gets extremely old when you’re approaching 40 years old, have little saved, still have student loan debt to pay off, and are still a post-doc hoping and praying for a faculty position that doesn’t exist. Tons of scientists are employed in healthcare or biopharma related fields, and R and D jobs constantly get axed. My former boss was an ivy graduate, 20+ years experience, 300+ articles, 40+ patents, and head of discovery. He’s been laid off multiple times over the course of the past 5 years and has had to constantly relocate. How can anyone buy a home or establish a family in a certain place if you have to constantly sell your house and relocate because scientific jobs in industry are so unstable? It gets old fast. Even when you make it in academia the problems still don’t end. Ever work for a PI with a funding problem? I think I’ve seen my PI age by 10 years within the past 2 years. We’re down to 2 people now after cutting down from 7 and have been plagued with funding problems for the past several years with no end in sight. This gets old too after your 12th straight grant application gets rejected. Do science for nothing and chicks for free (I want my MTV). Thanks, : ) , I will have my people (i.e. me) email his people. [USER=117790]@Dr. Courtney[/USER]: when were you a farmer? Also, how was the USAFA barrel friction project self-funded. How much did it cost, and did you pay or the cadets pay? [QUOTE=”atyy, post: 5172724, member: 123698″][USER=117790]@Dr. Courtney[/USER]: when were you a farmer? My wife and I owned a small farm business from 1995 to 2006. We had first stumbled upon our method by re-analyzing a data set from an experiment that had originally been performed to test a new formula for predicting gyroscopic stability of bullets in flight, so the method more or less fell into our hands for free once the bullet stability experiment had been completed. We immediately knew that we had not only solved the Army’s problem for needing a simple, cheap, and accurate way to measure bullet friction, we had also invented a way to test whether the purported bullet lubricants touted in patent and marketing claims really worked. The new method and our results in several applications caused a nice stir at the 2014 International Ballistics Symposium. I expect it might be a nice funding stream for us once the DoD starts funding small arms research again in earnest. Do you think there is a parallel , or “isomorphism” between Love vs Money and New , original , ideas and avenues vs gradual, technical improvements? I mean, publish-or-perish does not give you much of a chance to experiment, least you don’t produce on demand, but love allows you to develop research “you can believe in”. . I lost all of my money while doing power electronics projects, though I was a registered design consultant for last 6+ years and had around 11 years of design experience before that in some private companies. The hard luck began when I got my foot injured while practicing taekwondo on a heavy duty training bag at my home with full power many years back. i still feel the pain of same magnitude if stand up for couple of hours. I was bound to continue engineering design profession due to my interest in research and development area. The good thing that I’m still practicing taekwondo, however now my specialty in cardio taekwondo in which there is no sparring or body contact and whose main purpose is to develop health and fitness along with it’s defensive nature. Now I’m shifting my career back to physics lectureship after 15+ years and have applied in many schools, academies, institutes, and universities. If I can’t get offer from there then I’m ready offering home tuition services. Luckily I got teaching job. At least now I would be able to manage my very basic expenses! Thanks.